Everyone can be a National Geographic photographer at the monkey onsen. We have snow monkeys that can be seen around the resorts in Hakuba however a trip to the Onsen monkeys is a must while you are here if you enjoy wildlife experiences. Joshinetsu Kogen National Park is located in the valley of the Yokoyu-River, in the northern part of the prefecture. The name Jigokudani, meaning “Hell’s Valley”, is due to the steam and boiling water that bubbles out of small crevices in the frozen ground, surrounded by steep cliffs and formidably cold and hostile forests. 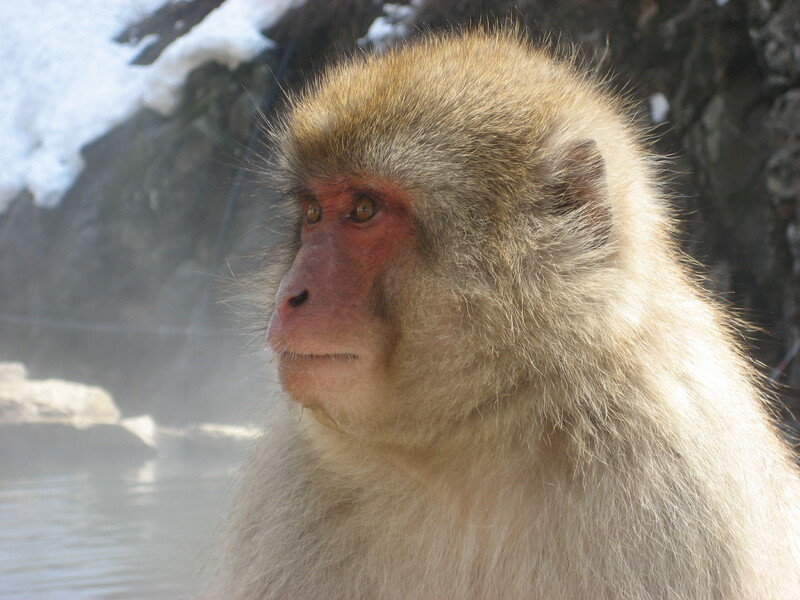 It is famous for its large population of wild Japanese Macaques (Macaca fuscata), that enjoy the colder months of the year sitting in an onsen bath. It is uncanny how humanlike they are as they stretch out in the natural hot waters and watch the tourists wander around taking photos. They seem to sit back and wonder what all the fuss is about. It’s just a bath. The White Horse Hotels can arrange an escorted tour or give you directions to get out there yourself. This entry was posted in Hakuba, Information, Sightseeing and tagged Japanese Alps, Monkey onsen, ski japan, snow Monkey, snowjapan. Bookmark the permalink.